For those of you that are new here…we lost our granddaughter Olivia Mabel three years ago, she was stillborn at full term. Yes, Little Man has a sister in heaven and our hearts are still break from missing her. Her birthday was a few days ago, and we wanted to do something special in her remembrance. Little Man’s family just moved to Texas and we thought it would be special to build a little Memorial Garden in her memory with some beautiful flowers to bloom along with her bench and plaque. 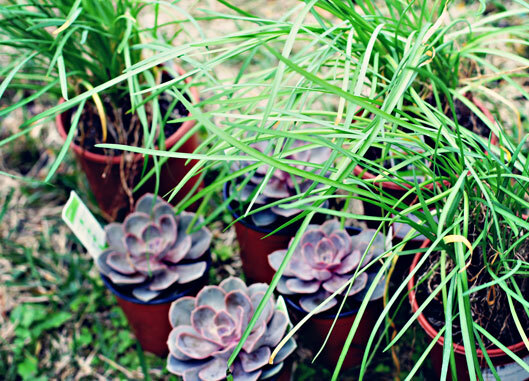 My daughter picked out purple flowers for the garden…Like Mother like Daughter see here. 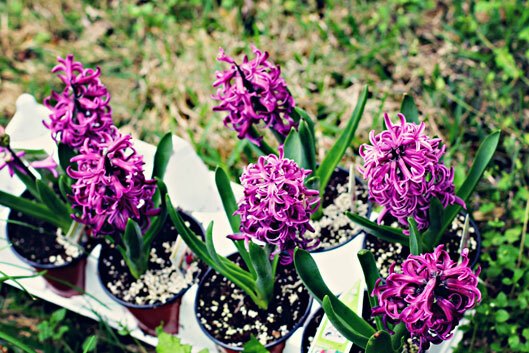 Along with Purple Hyacinth…love these! For all the tears that have been shed…she definitely would be back home with us. We only have our faith to know she is up in heaven with our Lord…taking very good care of her. In this time of remembrance of Olivia Mabel…can I tell you…this Little Man brings such JOY in times of sorrow! I hope in times of YOUR sorrow…you have your faith to pull you through and there is someone to bring you joy too! Can there be anything worse than loosing a child? I’m so sorry for your tragic loss. My heart goes out to you all. It feels so good and heartwarming to read your blog Laurie. In every post the love and affection for one another shines through. This is a beautiful tribute to Olivia. I didn’t know this, thanks for filling us in. Dina, there just isn’t anything worse in the world…I can tell you that. The heart aches everyday for her and my daughter. What a beautiful tribute, Laurie. I just can’t imagine losing a grandchild. The words on that bench really say it all. Sending you hugs and love. I haven’t walked in your shoes so I don’t pretend to understand the pain, but I do send you my sincere condolences. 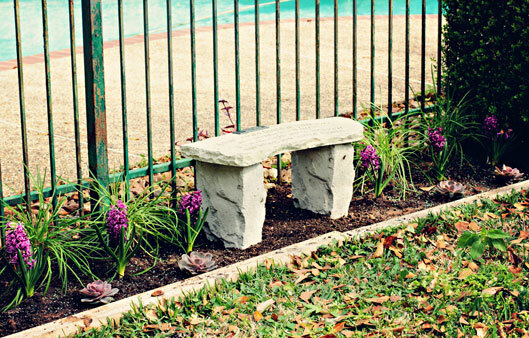 Your memorial garden is perfect. I think Olivia looks down on it with a huge smile on her face and may the handsome young man continue to provide happiness and joy to your heart. So sorry for your loss, but you have created a beautiful space for her. I think your heart seems like a very beautiful place in which to live. This pairs beautifully with Emily’s link up about belief – what a beautiful memorial garden and testament to your faith after such a trial. May God continue to bless you and your family. Thank you SO much Abigail…means alot to me! 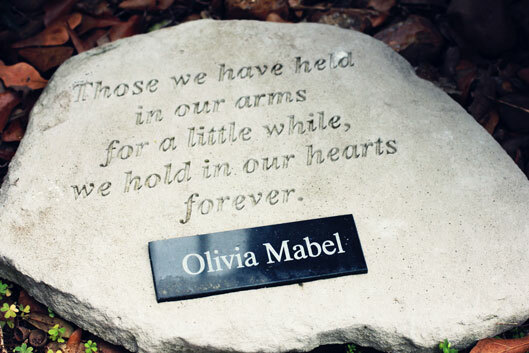 I’m in tears to read your beautiful memorial of Olivia… The little Memorial Garden is lovely. What a lovely memorial… I’m so sorry for your loss. I’m so glad you came by to share on Weekly Top Shot #68! So lovely to have such a beautiful memorial so sorry to hear of your loss. oh, so much sadness 😦 the garden is beautiful! You all certainly made a beautiful garden. Praying for you and the family. How very beautiful. My condolences, with smiles, for the loveliness with which you write of her. I am so sorry for your loss! The memorial garden is so pretty. A lovely tribute! Stopping in from Simple Things Sunday, wishing you a happy day! What a beautiful garden. I’m sorry for your loss. What a beautiful way to keep the memory of her alive. Dear Laurie, I was not aware of this know this tragedy, I’m so sorry for your loss … Can not imagine the sorrow in hour family … Such a beautiful memorial! Your post today has me teary eyed. What a beautiful memorial you have for your sweet angel.. I just know she is looking down with a big smile on her face. HI! 🙂 Thanks much for following my blog! Much appreciated! You have a unique blog here! Wish you all the best in all your future endeavours! Very-very nice blog! Congrats! Such a lovely garden and a beautiful tribute post. I work as a Women’t Health NP and have been in OB care for over 25 years. I have witnessed this too many times. A loss at term, with so many dreams and hearts broken … so very sorry for your family’s loss. Stillborn at full-term, your loss is beyond words. Most especially for Olivia’s mother. May time ease the pain for all of you, as you find a path to deal with your suffering. I’m so deeply sorry. How do we ever grasp how you and the family must feel? Just such a beautiful Memorial garden. What a lovely tribute to a sweet baby girl. I came to your memorial via Francine. I am sorry for your loss. Tending the garden must bring solace. I’m so moved by your words and such a beautiful tribute. I can’t imagine anything more difficult. Sorry for your pain and loss of your little grand daughter. 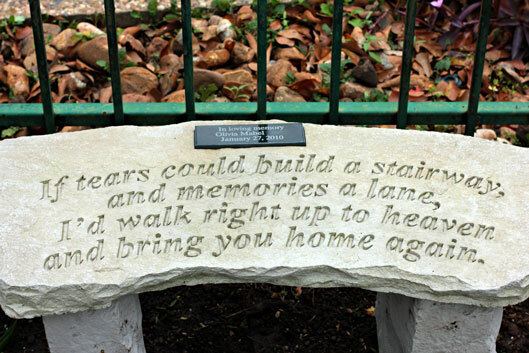 One of the loveliest memorials I have ever read and seen. I am sorry for your loss. Laurie, I am so sorry that you did not get to spend more time with Olivia Mabel on this side of heaven. The death of a child/grandchild has got to be the hardest pain to go through. Your post is such a beautiful tribute to her. Hugs! What a wonderful memorial! We have planted two trees in our backyard garden in memory of the dear ones who are no longer here with us. It really makes us feel so much closer. I didn’t know about this either! So, sorry you went through this… still are. Lovely tribute, beautiful words, touching faith in our Lord! Little Olivia is with Him and there is no doubt in my mind you will see her again! Blessings from above! Sorry for your lost – a beautiful tribute to your granddaughter. . I am sorry for your loss, my first son died in 1988 only three days after birth (hyperplastic left heart syndrome) so I feel you in my heart. Sorry to hear that. May your sweet little angel continue to rest in peace. A beautiful tribute to your granddaughter. My brother lost his daughter stillborn three weeks before she was due to be born. I have never seen such a small casket nor experienced such sorrow at a funeral. What a beautiful tribute to Olivia. You are so wonderful with your thoughts and putting them into such touching phrases. God Bless the memory of little Olivia. We ladies really missed you tonite. It was a fabulous show. We laughed all nite. Hope you get to see it. It is showing until March 9. Thank you for coming up with the idea. What a beautiful way to commemorate your granddaughter. And the purple flowers — gorgeous. I am sorry for your loss, and glad you found a way to channel your grief into a lovely memorial that can bring your family some peace. A beautiful tribute to your granddaughter. Sorry for your lost. What a heartbreak, so sorry for your loss – but I’m sure she is there watching over this wonderful garden you are planting!! I didn’t know about the little one, and I’m sorry to hear it. A testimony that love lives on. Very pretty garden. I remember your sorrow and think of you and your daughter often and pray for both of you. 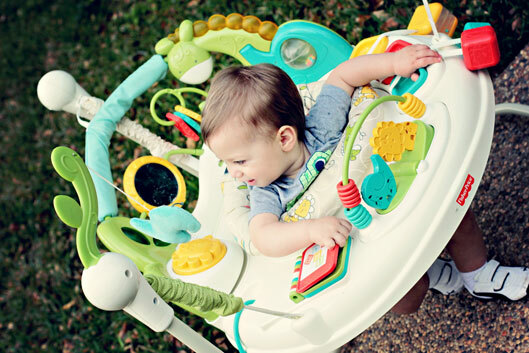 Like Little Man’s contraption, too. I’m so sorry for your loss. The garden is wonderful and a beautiful way to remember your precious Olivia. What a precious way to remember your beautiful girl! Our first granddaughter was born 4 months after our first born daughter, at age 28, went home to be with the Lord last May. She has brought us much joy during this last year of sorrow! Just holding her in my arms brings comfort. We are planning on planting a memorial garden this Spring in memory of our daughter, as well. So sorry for your loss. What a beautiful way to remember her sweet soul. Blessings. Oh Laurie! That breaks my heart. What a loss! Your faith is encouraging. What a lovely way to grieve and remember sweet Olivia. What hope to know you will see her again one day. So deeply sorry for your loss, but such a beautiful and special way to remember her. What a beautiful way to remember Olivia. I am so saddened to hear of your loss in your family, and although we don’t know why things like this happens, it does make you stronger and makes you hold onto your family a little bit longer. It is truly the hardest thing to deal with, a loss of a family member. I was holding my Father’s hand when he passed away, and that is something that I will never forget. Love you! Virtual Hugs! I didn’t know this. So sorry for your loss., may God bless you all each day. I believe that your little one is safe in Heaven by virtue of purity and innocence. Bless your heart, this is such a sad story. 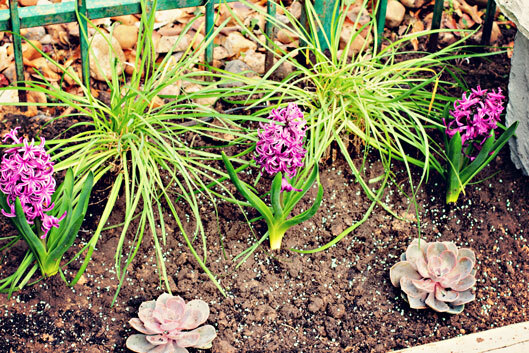 The memorial garden is such a wonderful way to honor her memory and give your family a place to remember the little one. The garden is lovely and a wonderful way to have a memorial of your granddaughter. So very sorry for your loss. Such a lovely memorial, so sorry for your loss. The garden and bench are really a great remberence of her. I’m sorry for your loss, the garden is lovely. Oh, so very very sorry for your loss. The garden is a lovely tribute to her. This is a very beautiful memorial. Sorry for your loss. I am so, so sorry to hear this. I can’t even put it into words. As a new grandmother I can only begin to imagine the pain you all felt! How horrible and terribly sad! I’m sure she is in heaven looking down and seeing everything you do for her!